‘Cause you’re not welcome anymore. Speaker Paul Ryan was adamantly against candidate and then President Trump. He said so in a tape released after the election of Ryan speaking with House Republicans. He was also allegedly linked to the release of the p*ssy tape which almost cost candidate Trump the election. Ryan did nothing to support the President’s border wall and to address the criminal Deep State. He actually allowed the corrupt FBI, DOJ and Mueller investigation to harass President Trump since before his inauguration. Now we come to find out that he was involved in pushing the fake Russia Fusion dossier. In early October, 2016, the TGP reported that the Clinton Campaign (Washington Post) released a video of Donald Trump bragging about grabbing p*ssy in an off the record conversation with Billy Bush. Of course this report was coordinated and all over the air waves up an until the election. The Los Angeles Times reported hours after audio was released of Donald Trump making sexually suggestive comments about a woman, that House Speaker Paul D. Ryan castigated Trump and said he would no longer attend their scheduled event on Saturday. Paul Ryan was scheduled to campaign with Trump for the first time on Saturday October 8th, 2016. Then that Sunday Donald Trump crushed Hillary Clinton in one of the most lopsided debates in political history. It was a brilliant performance. Trump made everyone forget about the WaPo tape. On Monday Paul Ryan sabotaged Donald Trump again and changed the political narrative. 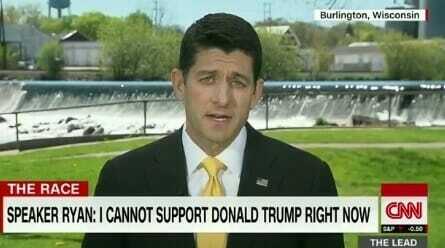 Ryan announced he will not campaign with or defend Donald Trump for the rest of the election cycle. This was an odd statement considering Paul Ryan had not once defended Donald Trump during the campaign. He only attacked Trump, the record-setting Republican primary winner. Liberty University president Jerry Falwell, Jr. suggested that GOP elites may have leaked the video. Jim Hoft at TGP spoke with a reporter at the time who believed the reports were true. It was GOP elites who released the audio to the Washington Post. GOP elites connected to Speaker Paul Ryan.